One millimeter. I let the tape measure back into its holster, pushed my glasses closer to my nose, and extracted the tape once again. I placed the tape measure’s end on the right crank arm and extended it to the middle of the pedal, remeasuring to make sure I wasn’t imagining the difference. One millimeter again. 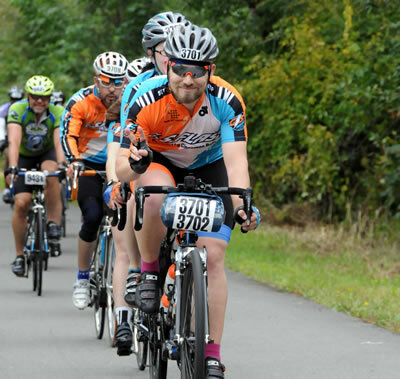 One millimeter had caused 110 miles of ankle and knee pain that only increased in intensity with each pedal stroke. In thirty-two years of riding and racing, I had never experienced ankle pain on the bike. Any other day, I would have packed it in, but I couldn’t quit on that day. It was STP, an event ridden 36 times by the man I so admired in life, Jerry Baker. I was riding STP in honor of my friend, with his family, on the team he founded. Shortly after Jerry’s passing, it seemed as if everyone on the team, myself included, automatically knew we would ride Seattle-to-Portland. Jerry’s son and I embarked on an updated GS Flash jersey design, one that would honor both Jerry and the team’s history. Jerry’s wife, Spot, and another team member, John, took care of the clothing order. 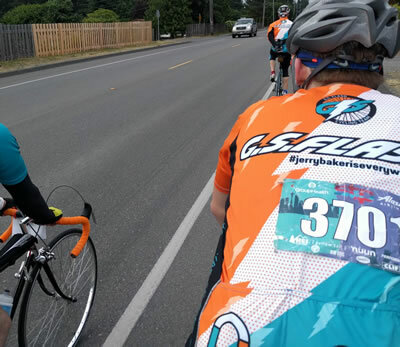 Jerry’s extended family, several former teammates, and a few long-time friends of Jerry’s joined together to don the new jersey and ride in honor of Jerry. It was a thrill to see so many GS Flash riders out on course. We departed from the start line at about 4:45 a.m. For the first seventy miles, I concentrated on keeping my head up and staying alert after a scant three hours of sleep the night before. We mixed in some heated city limits sign sprints to shake things up a bit. Jerry’s common mantras and phrases were repeating in my mind all day. My body felt great, with only minor aches setting in by about mile eighty. At mile eighty-eight, my ankle began hurting. In Tenino, a yellow jacket bestowed my first-ever bee sting in my left calf. I shook my leg hard and watched the bee swing back and forth with it, then fly off. Luckily, I was near the medic tent. They gave me Benadryl, and urged me to sit for twenty minutes to make sure I didn’t have an allergic reaction. It would throw our schedule off, but the team waited for me nonetheless. (This team rocks!) The Benadryl worked wonders, so I was able to continue. In Centralia, I accidentally ate soy, to which I have a nasty allergy. My throat slowly began closing. At the St. Helens rest stop, a group of us sat together on a grassy hill, taking in much-needed sustenance. We had all been there with Jerry before. I never imagined being there without him. We each seemed to be in our own quiet, ponderous state, when Jerry’s daughter mustered the courage to cry. She had a certain way she wanted to finish this particular STP together with her brother and sister-in-law, and it would only happen if she spoke up. The bee sting temporarily masked the pain of my ankle and knee, but eventually, they began screaming in unison for me to stop. I wouldn’t hear it though. With about fifty miles to go, I figured the damage was already done. Since I had made it this far, I could push through the pain to finish the ride. I always feel good in the last fifty miles, and this day was no exception. The bee sting hurt, my ankle and knee hurt, but my muscles felt great. By mile one hundred ninety-five or so, my left knee and ankle were barely functioning. I have no idea how I managed to force my left leg to turn the pedals over through Portland. It may have had something to do with the fact we were riding on the very streets I had walked and driven on with my dad as a child. It probably was more about knowing I could make it; that I had to make it. The four of us finished together, son and daughter hand-in-hand. More teammates finished a bit later. BikePT’s own Erik Moen finished with a faster group of GS Flash riders a couple hours before. Every GS Flash rider who started the ride finished it, some in one day, others in two. The times I had ridden it with him, I got the impression the ride usually went pretty smoothly for him, though I have heard of him encountering torrential downpours and ninety-degree heat. That one millimeter difference made STP harder than it had ever been. Ironically, it tested my mettle, and made finishing the event even more rewarding. One millimeter of pedal spindle length caused a total 2mm wider Q-factor, which threw my ankle out of alignment with my knee, and caused both ankle and knee pain. Q-factor is the spread between your feet imposed by the width of the bike’s bottom bracket, crank, and pedal widths. Everything Erik Moen has taught me over the years about bike fit is true. It really can be down to making micro adjustments with major performance gains, or just being able to complete rides without pain. STP is like this for many a rider. It is a tremendous challenge, often made harder by lack of training, unusual circumstances, unforeseen acts of nature, adverse weather, poor bike fit, component failures, and so on. Sometimes all it takes is one millimeter. Well, that, some soy, and a bee sting. Epilogue: When I discovered the 1mm difference, I swapped pedals back to the previous pair, and voila, no more ankle pain.